During the last two weeks of 2015, I bought some new things. I warned my husband that a number of large boxes might be arriving in rapid succession. He asked, “How many? How large?” I told him, The neighbors may think we’re re-doing our kitchen. To some extent, I was taking advantage of pre- and post-Christmas sales to round up things that had been sitting in various, virtual shopping carts during the fall. But some previously unseen (and even unimagined) items also caught my eye and I will be presenting some of them herein in the coming months. I had been looking for a pale grey work jacket and found this on YOOX. 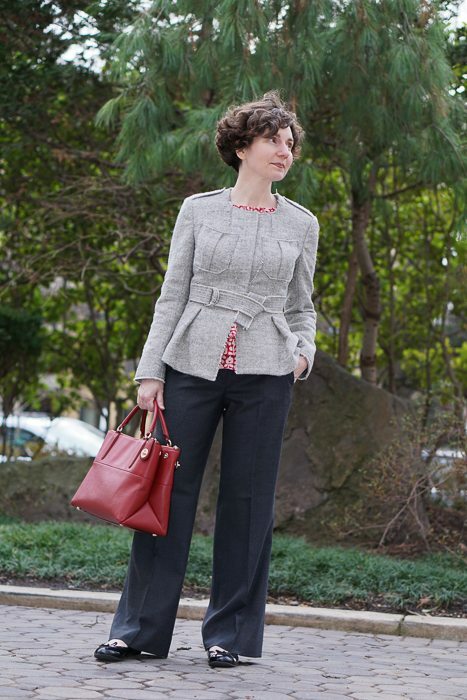 It’s paired with some favorites from my closet: a red and white silk top and dark grey wool pants. Let’s take a closer look, shall we? The fabric is a coarse weave of wool, cotton, and linen fibers, and the edges are frayed. The jacket is very fitted through the shoulders, bust and waist, but then has a cutaway peplum — which provides ease. Moment of truth: The jacket closed with three snaps, but the last one (at my waist) felt a little snug, so I got rid of it. The belt does the job of holding the jacket closed. I also had to have the sleeves shortened (at the cuff) by two inches. I thought it might be hard for the tailor to replicate the frayed edge, but he assured me that it was easy (and no more expensive than a regular sleeve). So, I share with you a reminder that it’s always good to ask a professional rather than assume. Here is the jacket as it looked on the YOOX model. She is wearing the belt tied in the back. Note that there are flaps on the chest pockets. The flaps seemed both bulky and busy to me, so I had them removed; this type of alteration is very inexpensive and if I’d been feeling a little more enterprising, I could have done it myself with my stitch-remover. I also elected to wear a shirt under the jacket, as a bare stomach is never appropriate at the office. Never. The back has very clean lines, in case you were wondering. 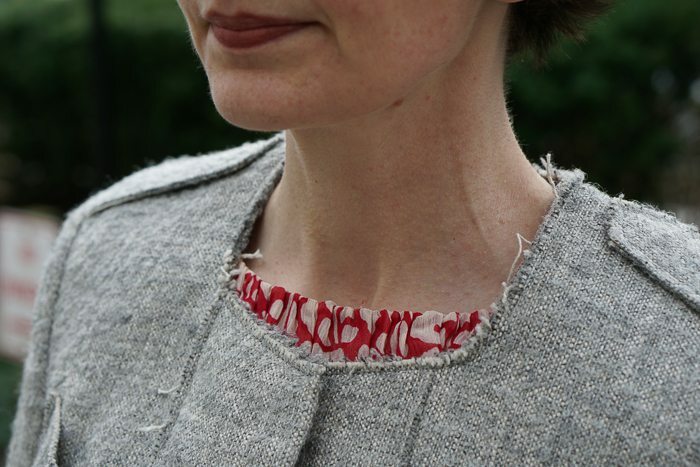 You are amazing to see the possibilities in a jacket that isn’t absolutely perfect from the get go. Well done! That is the magic of the Directice! I like it. Very interesting jacket. I especially like the back and the unfinished edges. The pocket flaps — such a transformative, yet simple change. I’m really enjoying reading about your approach. If I may ask, what’s your general return rate on Yoox purchases? The biggest challenge for me mentally is that so many of the brands they carry aren’t carried anywhere else — making it virtually impossible to assess sizing (i.e. does the brand or item run big/small, individual product reviews, etc.). As it is, I return the majority of what I buy online which makes me antsy about buying from sites that charge return shipping fees. Hi AK — In the original draft for this post, I had included stats about my yield rate and then I deleted them because I decided no one would care. But I do think the information is helpful, and you’ve asked, so here goes. For example, in this obscene frenzy of acquisition, I ordered 6 dresses and kept 1; I ordered 2 of the dresses in 2 sizes (because they were available). That’s an 16% yield. I think my overall yield rate from Final Fortnight of 2015 was around 25%. I am willing to take a chance if: (a) a garment can be returned and (b) returns are free or cost less than, say, $10. I am willing to pay a modest return fee because the convenience to me of mail-order is enormous — far better than getting in my car and driving to a shopping area (figure one hour, round trip) where I may or may not find anything that I like (and that fits) in a store. If the postage rate is flat — which is the model most vendors now use — it makes sense to order everything in one go, rather than piecemeal. One final piece of advice: I am pretty ruthless about what I keep. I only keep things that I really like and that can plausibly be altered (if they don’t fit perfectly). Hope this helps! Super helpful, thanks! Glad I’m not the only one making lots of returns — my bf laughs at me for it but it’s satisfying to know I’m being selective about what I keep. It does make sense to order everything in one go, so perhaps I need to adjust my mindset to treat each online order more like a trip to the dressing room — i.e. order more than I know I’ll keep, taking advantage of flat-rate returns. You see, this is exactly why I read your blog. You share outfits I vehemently nod my head to. Thank you!